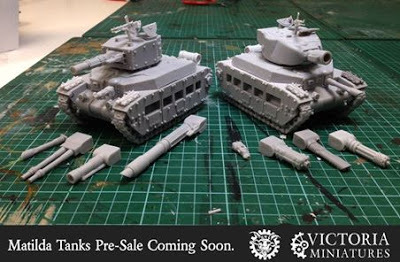 Victoria Miniatures: I have 50 Matilda’s incoming! 25 of each variant plus 25 sponson kits. These will go up for pre-sale in the next day or so. Notification of sale will be made initially via the email subscribers list. If you miss out don’t worry, another casting run will be done. I expect this first fifty to ship before the end of August, possibly earlier.